Bondurant, Flint. "BC Hydro". The Canadian Encyclopedia, 02 December 2016, Historica Canada. https://www.thecanadianencyclopedia.ca/en/article/bc-hydro. Accessed 22 April 2019. Vancouver, south view. Designed by architects Ron Thom and Ned Pratt, this building is a choice example of West Coast modern architecture (photo by Hellmut W. Schade). BC Hydro and Power Authority (BC Hydro), a provincial Crown corportation is the third-largest electric utility in Canada. It serves over 1.5 million customers in an area containing more than 94% of BC's population. Between 43 000 and 54 000 gigawatt-hours of electricity are generated annually, depending upon prevailing water levels. Most of the electricity is produced at 30 hydroelectric generating plants which have a total capacity of 9716 megawatts (MW), and more than 80% of this is produced by major stations on the Columbia and Peace rivers by 61 dams at 43 locations. The remainder is generated by 32 hydroelectric facilities, one major gas-fired thermal power plant and two combustion, turbine stations. Electricity is delivered to customers through an interconnected system of over 73 000 km of transmission and distribution lines. As of 31 March, 1998, the company had 4821 regular and 558 temporary employees. Its headquarters are in Vancouver and Burnaby. BC Hydro's Board of Directors is appointed by the lieutenant-governor-in-council and is responsible for the overall direction of the company. BC Hydro is regulated by the BC Utilities Commission. The provincial government decreed a freeze of basic tariffs for all classes of customers until 31 March, 2000, amounting to a seven-year rate freeze, since BC Hydro has not had a general rate increase since 1 April, 1993. BC Hydro was formed in 1962 by provincial legislation amalgamating the BC Electric Company and the BC Power Commission. The BC Electric Company was a former private utility that began hydroelectric and electric railway operations in the late 1890s and was acquired by the provincial government in 1961. The BC Power Commission was a public utility established by the provincial government in 1945 to consolidate the operations of many small utilities outside the BC Electric service area. 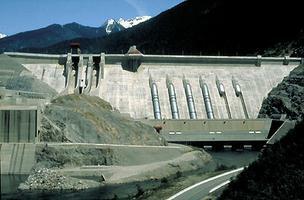 After amalgamation, BC Hydro began developing the hydroelectric potential of the Peace and Columbia rivers. The W.A.C. 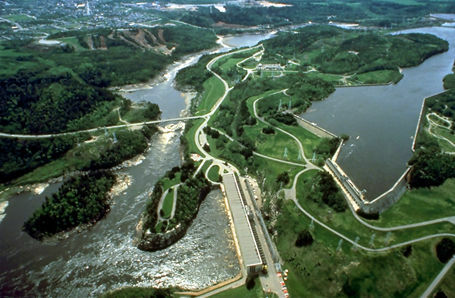 Bennett Dam on the Peace River is among the largest earthfill structures in existence, and the project's 2730 MW Gordon M. Shrum Generating Station was the world's largest underground powerhouse when it started operating in 1968. The Columbia River Treaty (signed in 1961, effective 1964) between Canada and the US opened the way for construction in BC of 3 dams, Duncan, Keenleyside and Mica, to regulate the flow of the Columbia River, providing flood control and enabling BC and the US to construct large power plants along the river and its tributaries. Only the Mica project, which has an ultimate capacity of 2604 MW, included generating facilities. The 594 MW Seven Mile project on the Pend d'Oreille River and the 700 MW Peace Canyon project on the Peace River began operations in 1980. The 1843 MW Revelstoke project on the Columbia River, completed in 1984, brought BC Hydro's total installed generating capacity to more than 10.5 million kW. Since 1984, capacity has been added in smaller increments, primarily through purchases from independent producers. The Company strives to meet increases in customer demand by increasing efficiency and output at existing facilities. In addition to providing electric power, BC Hydro distributed natural gas in the Lower Mainland and propane-air gas in Greater Victoria. It also operated city transit services in Greater Vancouver and Greater Victoria, an interurban bus service on the Lower Mainland and Vancouver Island, and a rail freight service on the Lower Mainland. Between 1979 and 1989, BC Hydro divested itself of the transit, gas and rail operations to concentrate on the electric business. 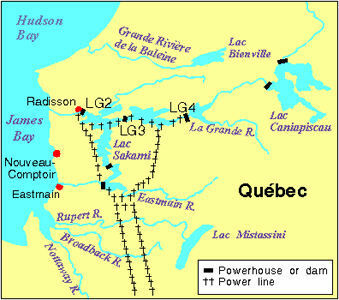 In the winter of 1995-95, organizational changes were made to structure BC Hydro around 3 distinct functional business units - Power Supply, Transmission and Distribution, and Customer Services - reflecting the 3 areas that the electric utility industry is segmenting into nationally, continentally and internationally. The company's mandate is to provide integrated energy solutions to customers in an environmentally and socially responsible way.